Superior lodge accommodation for families and groups. Opened in July 2007, Kingennie Court North and South are exceptional sister lodges that lend themselves perfectly to almost any occasion. Family gatherings, golfing parties, stag and hen weekends and small, intimate weddings have all been held at Kingennie Court, providing guests with a truly Scottish experience. Kingennie Court is perfect for family get-togethers or for groups of friends to get away from it all in the country surrounds. Opening the double doors into the living area, the spectacular, stylish space is revealed. 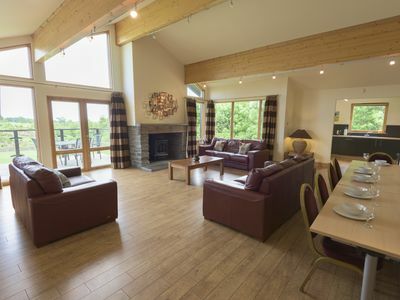 You are met with not only the area indoors but the grand tri-aspect windows that look onto the spacious decking area and the first tee of our 9 hole golf course along with the panoramic view stretching beyond into the rolling Angus countryside and the River Tay estuary. The living space of Kingennie Court is large and open plan yet has a comfortable “home from home” feel, with a real wood burning stove, comfortable seating area, plasma television with SkyTV and DVD player, dining area and fully integrated, fully equipped kitchen. The space is decorated and finished to the highest standard in a contemporary style. Each lodge comprises five large twin bedrooms, all with en-suite shower rooms. Each bedroom is immaculately furnished and decorated to the same contemporary style that can be found throughout the lodge. Two of these bedrooms also share the stunning views of the golf course and beyond, with the other three bedrooms all benefiting from large windows and the peace and tranquillity of the private courtyard. For added comfort there is also an additional family bathroom with bath located within these lodges. Property is subject to a £100 Refundable damage deposit.